"A low calorie soup that's easy to make." Bring chicken broth to a boil in a large pot; cook chicken breasts in the boiling water until no longer pink in the center, about 20 minutes. Remove chicken from the chicken broth using a slotted spoon and shred with a fork. 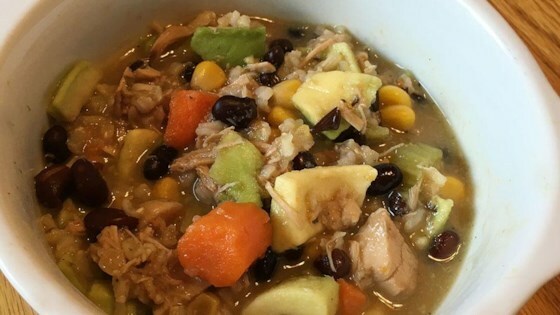 Stir shredded chicken, celery, onion, carrots, corn, black beans, sage, pepper, salt, and bay leaves into the chicken broth and cook until vegetables are slightly softened and flavors of soup have blended, about 20 minutes. Add brown rice to soup and simmer until rice is tender, about 1 hour.